OzCoasts mapping indicates lots of sports grounds around Australia are threatened by sea level rise from climate change. This includes Manly, in Tony Abbott's own electorate. The seas are rising because water expands as it warms. Simple physics, that all the denial in the world won't make go away. Ignore Margaret Thatcher's legacy of taking climate change seriously; put action against climate change into reverse; put a climate denier in charge of reviewing the Renewable Energy Target; abolish the Climate Change Authority; let a few polluting companies put CO2 into the atmosphere for free - what have we got to lose, right Tony ? The kids who would have been playing sport at Kierle, or Nolan, or Passmore in future have plenty to lose. Further up the Northern Beaches, local member Bronwyn Bishop doesn't even pretend to accept climate science (or maybe any science). It's all just a theory. What won't be so theoretical is the difficulty people in the area have in trying to play land based sports on grounds covered in water. OzCoasts maps for 110cm sea level rise impacts show the pitch at Bayview inundated, together with the golf course. The ground at Jacksons Road, Warriewood, shows as inundated. 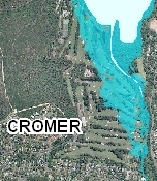 Cromer Golf Club would experience significant inundation with the impacts from 1.1 metres sea level rise. The Sydney Pacific Athletic Club would experience partial inundation of its track and one of the nearby sports fields would be more substantially inundated with 1.1 metres sea level rise.